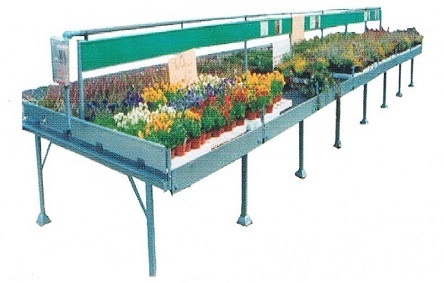 Cambridge Bench for garden centres offers all the advantages of our latest modular immensly strong and regid design. Suitable for outdoor or indoor use. Choice of tops, wire mesh or flood trays & heat pads. Simple modular design allows rapid assembly. Centre or back display panel serves as holder for misting. Fixed plate feet or adjustable legs for uneven floors. Low maintenance hot dip galvanised.